LBJ is a 2016 American political drama film about the beginning of the presidency of Lyndon B. Johnson following the assassination of John F. Kennedy. It was directed by Rob Reiner and written by Joey Hartstone, whose script was on the 2014 Black List. The film stars Woody Harrelson as the titular President, along with Richard Jenkins, Bill Pullman, Kim Allen, Michael Stahl-David, Jennifer Jason Leigh, Jeffrey Donovan, Doug McKeon, C. Thomas Howell, and Michael Mosley. Principal photography on the film began in New Orleans on September 21, 2015, and it premiered at the Toronto International Film Festival on September 9, 2016. It was theatrically released by Electric Entertainment and Vertical Entertainment on November 3, 2017. The film received mixed reviews from critics, who called it "surface skimming" and criticized Harrelson's makeup, and with some comparing it negatively to the HBO film about Johnson, All the Way. The story centers around the political upheaval that Vice President Johnson faced when he was thrust into the presidency at the hands of an assassin's bullet in November 1963. After Kennedy's death, Sarah Hughes administers the oath of the office for LBJ. With political battles on both sides of the aisle, Johnson works to heal a nation and secure his presidency by passing Kennedy's historic Civil Rights Act. Wallace Langham as Arthur M. Schlesinger Jr. The script for LBJ, a political-historical drama written by Joey Hartstone, was one of the winners of the 2014 Black List of unproduced screenplays. On June 16, 2015, Woody Harrelson signed on to play the lead role of 36th President Lyndon B. Johnson, while Rob Reiner signed to direct the film. The film was produced by Acacia Entertainment, Savvy Media Holdings, Castle Rock Entertainment, and Star Thrower Entertainment, and financed by Acacia and Savvy Media. Producers on the film are Matthew George, Reiner, Liz Glotzer, and Tim and Trevor White. Principal photography on the film began in New Orleans on September 21, 2015. It was also shot in Baton Rouge, Dallas, and Washington. Principal photography wrapped in December 2015. The film had its world premiere at the Toronto International Film Festival on September 9, 2016. Shortly after, Electric Entertainment and Vertical Entertainment acquired distribution rights to the film. It was theatrically released on November 3, 2017. LBJ debuted to $1.1 million at 659 theaters, finishing 14th at the box office. On review aggregator website Rotten Tomatoes, the film has an approval rating of 57%, based on 79 reviews, with an average rating of 5.7/10. The site's critical consensus reads, "LBJ loses sight of its complicated subject, ignoring the more intriguing aspects of his personality and career in favor of a frustratingly ordinary biopic treatment." On Metacritic, which assigns a normalized rating to reviews, the film has a weighted average score 54 out of 100, based 19 critics, indicating "mixed or average reviews". David Ehrlich of IndieWire gave the film a C, and said "Harrelson, who has a gift for squeezing charm out of even his most monstrous characters, leans hard into the contradictory notion that Johnson is a power-hungry humanist. The result is a performance that is both wildly ridiculous and appreciably grounded ... Harrelson’s turn seizes on his unique charisma in order to disentangle LBJ from the policies that have defined his legacy." TVOvermind critic Nat Berman gave the film a positive review, and praised Reiner's cast selection. ^ a b "LBJ (2017)". Box Office Mojo. Retrieved December 26, 2017. ^ Campbell, Christopher (December 11, 2017). "The Disaster Artist' and 'I, Tonya' make their mark in an otherwise poor year for biographical movies". Film School Rejects. Retrieved March 12, 2018. ^ Giles, Jeff (November 2, 2017). "Thor: Ragnarok is Certified Fresh". Rotten Tomatoes. Retrieved November 3, 2017. ^ a b c d e Siegel, Tatiana (June 16, 2015). "Woody Harrelson to Play LBJ in Political Drama Directed by Rob Reiner". hollywoodreporter.com. Retrieved June 22, 2015. ^ Busch, Anita (September 14, 2015). "Jennifer Jason Leigh To Portray Lady Bird Johnson in Rob Reiner's 'LBJ'". Deadline Hollywood. Retrieved September 21, 2015. ^ McNary, Dave (September 9, 2015). "Michael Stahl-David Cast as Bobby Kennedy in Rob Reiner's 'LBJ'". variety.com. Retrieved September 21, 2015. ^ McNary, Dave (July 22, 2015). "Richard Jenkins Joins Woody Harrelson's Lyndon Johnson Movie 'LBJ'". Variety. Retrieved August 23, 2015. ^ Hipes, Patrick (July 27, 2015). "Bill Pullman Elected To Join Rob Reiner's 'LBJ'". Deadline Hollywood. Retrieved August 23, 2015. ^ McNary, Dave (September 15, 2015). "Jeffrey Donovan Portraying JFK in Rob Reiner's 'LBJ'". variety.com. Retrieved September 21, 2015. ^ Busch, Anita (August 19, 2015). "'LBJ' Finds Its Jackie In Relative Newcomer Kim Allen". Deadline Hollywood. Retrieved August 23, 2015. ^ a b c d e f A. Lincoln, Ross (September 21, 2015). "Allison Tolman, Michaela Watkins Join Will Ferrel-Amy Poehler Comedy; LBJ Packs Cast As Production Starts". Deadline Hollywood. Retrieved September 22, 2015. ^ a b "LBJ: Full cast & credits". imdb.com. Retrieved 22 January 2016. ^ Tramel, Jimmie (October 19, 2015). "Pop culture: C. Thomas Howell recalls 'Outsiders' mania during Tulsa filming". tulsaworld.com. Tulsa World. Retrieved August 26, 2016. ^ A. Lincoln, Ross (September 18, 2015). "Pooch Hall Knows 'A Dog's Purpose', Doug McKeon Joins LBJ". Deadline Hollywood. Retrieved September 21, 2015. ^ McNary, Dave (September 17, 2015). "'Sirens' Star Michael Mosley Joins Rob Reiner's 'LBJ'". variety.com. Retrieved September 21, 2015. ^ Bloom, David; Yamato, Jen (December 15, 2014). "'Catherine the Great' Leads The Blacklist 2014: Full List — Update". Deadline Hollywood. Retrieved June 22, 2015. ^ Scott, Mike (September 22, 2015). "Rob Reiner's 'LBJ' begins shooting in New Orleans, with Woody Harrelson starring". nola.com. Retrieved September 23, 2015. ^ "Woody Harrelson's 'LBJ' Funeral Scene Casting Call in New Orleans". projectcasting.com. September 15, 2015. Retrieved September 21, 2015. ^ "Toronto To Open With 'The Magnificent Seven'; 'La La Land', 'Deepwater Horizon' Among Galas & Presentations". Deadline. July 26, 2016. Retrieved July 26, 2016. ^ Owen Gleiberman (2016-05-11). "'LBJ' Review From Toronto: Woody Harrelson in Rob Reiner's Biopic". Variety. Retrieved 2016-09-16. ^ "Electric Entertainment, Global Pictures Media team on Rob Reiner's 'LBJ'". ^ "LBJ". Vertical Entertainment. Retrieved November 4, 2017. ^ Brooks, Brian (November 2, 2017). "Rob Reiner's 'LBJ' On Ticket; 'Last Flag Flying', 'Lady Bird' Bow – Specialty B.O. Preview". Deadline Hollywood. Retrieved November 4, 2017. ^ "LBJ (2017)". Rotten Tomatoes. Retrieved November 4, 2017. ^ "LBJ reviews". Metacritic. Retrieved November 3, 2017. ^ David Ehrlich (September 16, 2016). "Woody Harrelson's Hammy Performance Almost Makes 'LBJ' Worth Endorsing — TIFF Review". IndieWire. Retrieved August 18, 2017. 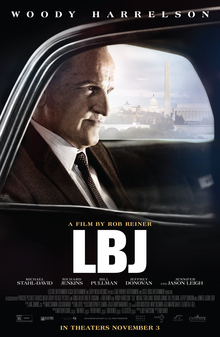 ^ "Rob Reiner Directed Film "LBJ" Has an Awfully Impressive Cast". 18 September 2017.